FERGUSON, Mo. 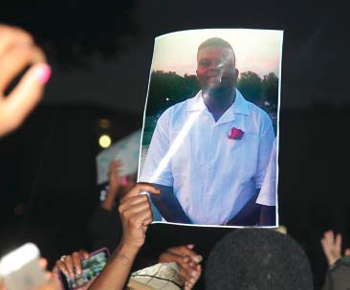 - Michael Brown, 18, was supposed to be starting college in early August, instead he is listed among Black males shot to death by police, security guards, and self-proclaimed vigilantes. Oscar Grant III, Sean Bell, Trayvon Martin, Jordan Davis, and Jonathan Ferrell are among familiar names of those whose lives were taken. Unrest spread among residents in the apartment complex as a result of the shooting and as Michael’s lifeless body lay in a puddle of blood. St. Louis County Police Chief Jon Belmar flanked by Ferguson Police Chief Thomas Jackson, told reporters Aug. 10, “One of those individuals at the time came in as the officer was exiting his police car. Allegedly pushed the police officer back into the car where he physically assaulted the police officer. It is our understanding at this point in the investigation that within the police car there was a struggle over the officer’s weapon. There was at least one shot fired within the car after that. The officer came back out of the car, he exited his vehicle, and there was a shooting that occurred where the officer in fact shot the subject … they were fatal injuries.” The officer, said to be a White six-year veteran, has been placed on paid administrative leave. “All my hard work and everything I put into to him they just took that, with no compassion,” said Michael’s mother Lesley McSpadden. Assisting the Brown family are community activist Anthony Shahid, members of the Fruit of Islam from Muhammad Mosque Number 24 in St. Louis and attorney Benjamin Crump, who is now assisting the Brown family. Community anger reached a boiling point after the shooting and with subsequent events. Some 600 people gathered near where Michael’s body lay and there were stand-offs with police, who reported that shots were fired in the area. Police would not allow anyone near Michael’s remains. Later many marched and held vigils to call for justice, seek answers and to comfort one another. 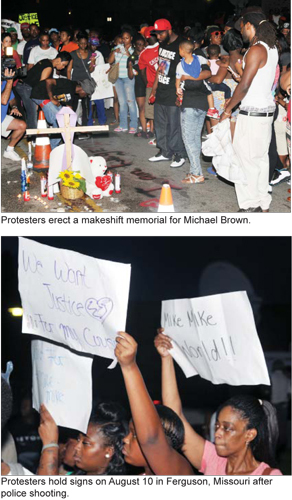 Demonstrations were held and memorials erected near the spot where Michael was killed, and rallies were held outside the Ferguson Police station. Officers in riot gear and with dogs were on duty at the gatherings. “We are developing a list of demands that we want put forward, which will include publicly disclosing the name of the White officer involved in the shooting, secondly for him to be immediately fired and charged with murder, third is for the Ferguson Police Department to issue their protocol manual on how they are to respond in a situation like the one Saturday, and the fourth one was to reflect the racial population of the officers responding to the community,” declared longtime activist Zaki Baruti of the Universal African Peoples Organization. Local and national media outlets quickly showed scenes of looting, but according to social media and others on the ground, the media did not show police officers firing at peaceful protesters and provoking demonstrators. Chawn Kweli, national chief of staff for the New Black Panther Party, said SWAT team members confiscated cell phones of protesters exercising their rights to video record law enforcement officers. There have been some arrests and reports that cellular telephone capabilities are limited in the area. “Tensions are very high and at this point the apartment complex is still surrounded by SWAT,” Mr. Kweli told The Final Call a day after fatal shooting. Mr. Kweli described a chaotic scene Aug. 10 when protests formed at the apartment complex where Michael was killed. Mr. Kweli knows the difference between sounds made by rubber bullets and live ammunition. SWAT team members teargased and repeatedly fired live ammunition with the intent to kill or maim into a crowd of over 2,000, which included many women and children, he charged. “It was beyond the shadow of a doubt live ammunition,” Mr. Kweili said. “There has not been a riot in St. Louis, or anything like this in over 60 years,” said Nation of Islam Student Minister Donald Muhammad of Muhammad Mosque No. 28. Organizations such as the New Black Panther Party, the Tauheed Youth Group, the Organization for Black Struggle, and the UAPO have been very active in the protests. Many say were it not for police agitation, protests may have remained peaceful. “These young people did not get up yesterday and say we are going to riot today, I was with a lot of them throughout this situation, and they were agitated. We arrived for a peaceful vigil, calling for justice and the St. Louis County Police arrived with riot gear on storming through the crowds, with little regard for respect,” said Bgyrl, a longtime St. Louis hip-hop pioneer and activist. This same sentiment was shared by over a dozen youth who wanted to be part of a campaign to mobilize for justice. Others say the rebellion is the result of decades of neglect, racism, and police brutality in the area. It has gotten to the point where the people feel like they have to stand up and declare they are not going to take it anymore, they said. Rev. Al Sharpton of the National Action Network, in an Aug. 10 statement, said he spoke with Brown family members who asked him to come to St. Louis. National Action Network field staff have been dispatched to the area to work with others, he said. The FBI is looking into possible civil rights violations arising from the shooting, said Cheryl Mimura, a spokeswoman for the FBI’s St. Louis field office. She said the FBI would be investigating regardless of the public attention surrounding the matter. Nearly three dozen people were arrested following a Sunday night candlelight vigil Aug. 10 after crowds looted and burned stores, vandalized vehicles and confronted officers who tried to block access to parts of the city, the Associated Press reported. St. Louis County police spokesman Brian Schellman said 32 people were arrested for various offenses, including assault, burglary and theft. Two officers suffered minor injuries, and there were no reports of civilians hurt. Several businesses were looted, including a check-cashing store, a boutique and a small grocery store. People also took items from a sporting goods store and a cellphone retailer and carted rims away from a tire store. A spokeswoman for St. Louis County Executive Charlie Dooley said tear gas had been used. Ferguson Police Chief Tom Jackson said that there’s no video footage of the shooting from the apartment complex or from any police cruiser dashboard cameras or body-worn cameras that the department recently bought but has not yet put to use. Lesley McSpadden said she did not understand why police did not subdue her son with a club or stun gun. She said the officer involved should be fired and prosecuted. The killing drew criticism from some civil rights leaders, who referred to the 2012 racially charged shooting of 17-year-old Trayvon Martin by a Florida neighborhood watch organizer who was acquitted of murder charges. Atty. Crump also represented Trayvon’s family. Ferguson’s population of about 21,000 people is almost 70 percent black.